​​Phil was born in Barrow-in-Furness, a small shipbuilding town in the North West of England then in the county of Lancashire, but in 1974, reclassified into the Lake District county of Cumbria. ‘The shipbuilding industry in Barrow dates back to the mid 1800s and, with a major expansion taking place during WW II, it became the primary employer in the town. I saw my future inevitably mapped out by commencing an apprenticeship in the shipyard along with most other school leavers in the town, and completed an apprenticeship as a shipbuilding draughtsman in 1975. Later, feeling restless, I began applying for positions further afield’. ​​‘In October 1976, following an extended interview and medical, I set off to the Far East to commence training as an Inspector in the Hong Kong police force. My father had been a Police Officer and, many years before, my mother had had the privilege of being the first female officer in the Barrow force’. My duties in the uniform branch commenced in the business district of Hong Kong Island. Postings from traffic branch to special branch and anti-vice duties to illegal immigration duties ensured an exciting, varied and fulfilling 32 year career’. 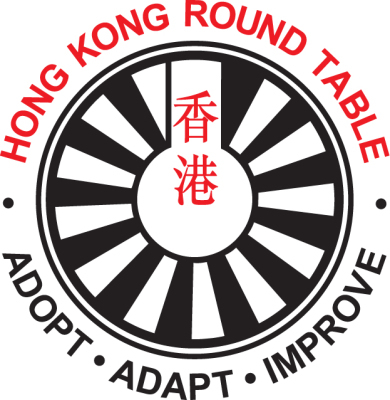 ​​‘I joined Hong Kong Round Table 3 in my early 30s, then it was full steam ahead for the next 10 years. The Club’s claim to fame was running a 24 hour Pedal Kart grand prix raising money for local charities. It started in Hong Kong in 1986 from an idea originating from Bristol University in the 1960s’. Phil was Chairman in 1993 and as such headed the organizing committee which ran the 24 hour Pedal Kart Grand Prix that year, raising over HK$2 million (£180,000) to aid charities primarily related to those helping handicapped children. Now married to Eliza, (also a retired police officer), he has two adult children from a first marriage and wife Eliza one son from hers. 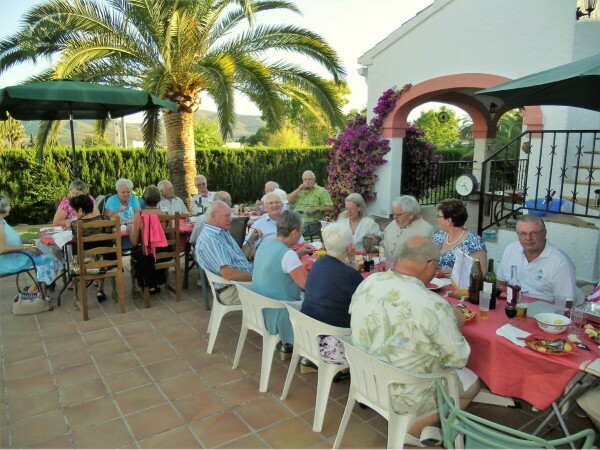 dinner was at Mil Aromas, Javea and there was also a welcome return to ‘home socials’ with Chairman Phil hosting an alternative ‘Paella/Fish & Chips’ supper and the Williamson’s a ‘Curry Fest’ around their pool, with swimwear an option. 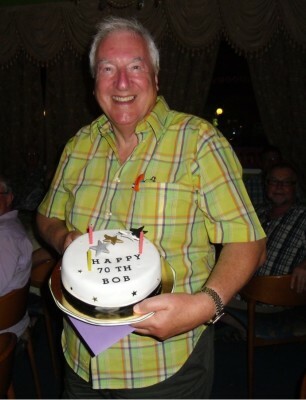 Costa Blanca hosted Billy Boule which was followed by dinner at the Indian Palace, Javea, where Bob Oxley was presented with a cake on his 70th birthday. Christmas lunch was again held at Salamanca, Jalon. We had a visit to the Caves at Benidoleig followed by lunch at Monroe’s, Pedreguer and on Ladies Night, we joined with the Royal Society of St George for a Dinner & Dance at the Apartotel Pinosol, Javea. 39 members and partners attended the first Cluster hosted by Calpe and District. A welcome party was held at the Bolero Jazz Club, and on Friday we survived a torrential downpour before supper at Restaurante Capricho. The Gala Dinner was a superb occasion marked by an ‘interesting’ speech by National President David Smith, who was presented with a cheque for €500.00 for his ‘Prostrate Cancer Charity’ appeal. On Charter Night, guest Chris Duffin, President of ‘Costa Blanca Women in Business’ and a retired Prison Governor, spoke of her experiences. New Chairman Michael Beaumont has the unique distinction of having joined the Club twice. ‘I joined Princes Risborough Table in the 70s. During my time there, my then wife Julia became Chairman of Ladies Circle. I was then working with computers, but prior to moving to Spain in the late 80s, I was teaching in a UK prison. ​​I joined the Costa Blanca 41 Club, and did a spell as Headmaster at the Benidorm International School, before moving to the Maths Department at Javea International School (XIC). My duties severely restricted my attendance at 41 Club, and eventually it ceased completely. On retirement, I started offering private tutoring, and this gave me the opportunity to re-join the Club, become more active and include my partner Joanne’. 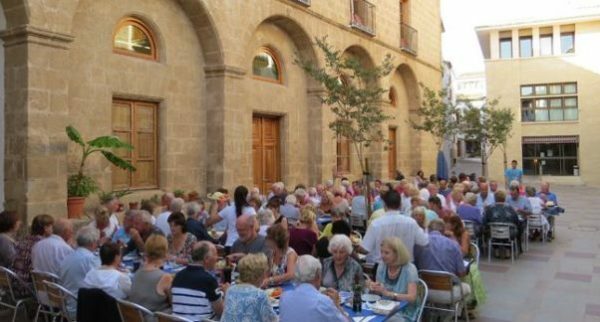 ​​celebrating ‘Happy days are here again’ with the Javea Players Theatre Group. We were almost word perfect with ‘Pack up your troubles in your old kit bag’, but struggled with ‘Sister Susie’s sewing shirts for soldiers, such saucy soft short sleeved shirts my shy young sister sews’! ​​Past National President Vaughan Harris and wife Jill were welcomed as new members. The Cluster was hosted by Costa del Sol, Ladies Night was held at Chez Angel and Christmas Lunch at Pepe’s, Alcalali. We had a tour of the almond blossom fields in the Jalon Valley with lunch at the Piscina Restaurante, Parcent. Charter Night was at El Elefante, Javea. Michael recalls, ‘Charter Night for me was very special. A retired ballerina, Graciela Kaplan, agreed to do a verbal and visual presentation of her experiences. Unfortunately, part way through, problems arose with the projector. Calling on her professionalism, her verbal recollection of her life as a ballerina soon made her audience forget all about the lack of visual support. This is the eighteenth of a series of articles on the history and development of the Costa Blanca 41 Club. It is being compiled from newsletters written by Ted Homewood, (who took over the role from Tony Ogden), and from pen portraits provided by the incoming Club Chairmen. All the text above in italics is directly quoted from newsletters and documents available at the time, and the web posting and additional illustration images are provided by Gordon Macnab.